My next deadline is in mid-June (for publication in the August issue). I am trying to be as current as possible considering the six+-week gap, so I would appreciate getting original fiction for any upcoming (June-July-August) issues as soon as possible. For the last seven or so years, I’ve been looking at dark fantasy and horror fiction from an annual P.O.V. for The Year’s Best Dark Fantasy & Horror series, i.e. I haven’t been looking at WHEN anything was published as long as it fell within the year I was covering, nor was I paying all that much attention (initially) to what was a periodical and what was an anthology. Now it matters! At least for these purposes. So, if you edit or publish a periodical (or what is supposed to be a periodical) heads up! I need to see your original fiction on a timely basis. Online, print, whatever. Edited, yes, but it doesn’t need to be the final final version or publication lay-out. Nor do I need the entire issue, just the original fiction. Word docs or rtf will do. For now, at least, I’m looking only at periodicals for Locus. Anthologies and collections I still need for “year’s best,” but for the next deadline—only periodicals. I may not be able to cover your publication. I have limited room. (But I definitely can’t review it if I never see it at all. This holds true for Year’s Best, too) No promises. I don’t know what the hell “horror” or “dark fantasy” or “dark fiction” is either. I have broad definitions. Try me. You can get some idea of what I think from What the Hell Do You Mean by “Dark Fantasy and Horror”?, the first introduction for The Year’s Best Dark Fantasy & Horror: 2010. I regularly find great dark stuff in periodicals that are not necessarily all dark. So, I may review just the dark stuff. Don’t really know. Authors: Sorry, but for this I need the material from the editor or publisher of the magazine. 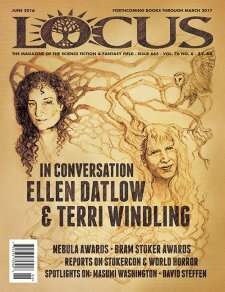 I’ll try not to duplicate the efforts of Gardner Dozois or Rich Horton, who both review short fiction for Locus, but that may happen. Reviews are opinion. I strive to be a fair, professional reviewer. I am not a cheerleader. Yes, I am qualified: I reviewed regularly for Publishers Weekly for over a decade, was review editor for the original print incarnation of Fantasy for a few years (returning in 2009 to edit reviews for its online version), a columnist for Cemetery Dance for five years, and editor for the print section (reviewing, interviewing, and writing articles about sf/f/h) of CFQ (Cinemafantastique) Magazine (2004-2006) I served as nonfiction editor for Weird Tales magazine in 2011. I am a member of the National Book Critics Circle. Email material (or ask questions): paula@prime-books.com or paulaguran@paulaguran.com. *If you are one of those folks who don’t feel Locus pays enough attention to the dark side…hey, obviously they are trying to do something about it or I would not have this gig.